A festival of music, arts, dance, camping & destination bound to take your mind of the mundane routine of life and allows you to experience another world filled with music ranging from fusion to rock, electronica to metal, whirling dancers to art installations, discovering nature, camping under the starry sky and so much more. In its 3rd edition, the festival would showcase 2 stages, a food court, bar in the woods, pop up stages, camping sites, workshops, art installations and much more. 1. What time do the gates and the ticket booth open? Gates and ticket booths will be open at 6 AM on both days of the festival. 2. What will the weather be like at the festival? The average maximum daytime temperature in Ooty in January is generally pleasant. For more accurate information, please check www.accuweather.com closer to dates to plan your travel. 3. Where is the nearest train, bus-station and airport from venue? 4. What kind of music is played at the festival? 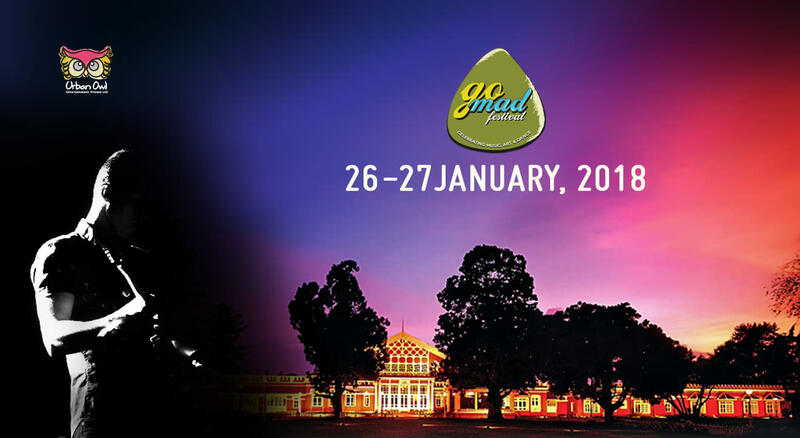 The festival is a multi genre festival featuring the best of talent from India and globally across rock, jazz, blues, fusion, metal, classical, world music, electronica and so on. The festival will also showcase a few dance forms. 5. Do I have to wear a wristband? On entry to the festival, your ticket will be exchanged for a wristband. This wristband will act as your pass out and is proof of your ticket purchase, so you must wear it at all times. Please note the wristband is not transferable, non-refundable and not replaceable – it becomes invalid if tampered or broken. If you have an exceptional circumstance that requires your wristband to be removed for any period of time then you must organize this with the ticket booth prior to removing your wristband! 6. Once inside, can I leave and return later? Exit and re-entry is clearly at the discretion of the Organizer and highly not advisable. To exit and re-enter one needs to go to the re-entry/exit queue at the main gate and go through Security procedures again. You must have a valid daily wristband and Original ID at all times. 7. Can I get cash at the festival? Are there ATM’s available? No. However there will be multiple swiping machines across festival areas to buy coupons. Kindly carry sufficient cash to take care of your needs. In the case of emergencies there are ATMs outside the Venue. 8. Will there be lockers available on site? Limited Lockers will be available for the camping packages at the camping area only. 9. Can I bring a bag? During GMF at the Fernhills Royal Palace you can! Backpacks and Handbags are allowed as long as they are not bigger than an A4. However you will need to have your bag scanned through security. We will do anything in our power to keep the security process as fast as possible, therefore we would like to advise you to leave your bag at home and just carry what is necessary. 10. I'm not 18 years old yet, can I go to the event if an adult accompanies me? Yes the event is open to all age groups. But children below 16 have to be accompanied by an authorised adult. Attendees will be tagged appropriately as per LDA, as alcohol will be served at the premises. So it is necessary to carry your original Govt. ID while redeeming your passes for Tags at the venue. 11. Can I drink alcohol at the festival? The LDA in Tamil Nadu is 21 years. To enjoy an alcoholic beverage and unwind responsibly make sure you are 21 and over. Most importantly please ensure you bring along a valid and current photo ID (a passport, license or proof of age card). 12. What is the drug policy? We conduct an absolute zero tolerance policy towards substance abuse. If it is suspected that you have drugs on you, or are under the influence of any illegal substances you will be denied entry into the festival, evicted from the venue and handed over to the authorities. 13. Can I bring my own food and drinks? No, you cannot bring your own food and drinks. There are lots of options for food and beverages inside the venue and at the Palace hotel. 14. Is the event accessible to disabled people? Yes, the event is accessible to disabled people. However we will require them to be accompanied by a family member or medical representative to take care of all their needs and movement across Festival areas. A map detailing locations of parking, viewing platforms and toilets will be available closer to the festival date. 15. Is First Aid available at the festival? 16. What if I have special medication or injections I need to take for medical reasons? As long as you have a valid doctor's note with you, you will be able to store your supplies at the first aid station. There you'll be able to take your medication. 17. What if I follow a strict health diet for medical reasons? Can I bring my own food then? This may be allowed with an accompanying a valid doctor's note, solely at the Organizers/Security’s discretion. 18. Is there a lost and found property area? Yes. Please note that the Organizer will not be responsible for loss or damage of your belongings. 19. Tickets are being sold on other websites too? All popular events are confronted with fraudulent organizations and people that try to resell tickets above market price, purely for their own benefit. Our Ticketing online will be available with BookMyShow and on www.gomadfestival.com. Any new portals we onboard will be communicated across all our platforms. Physical tickets will be available at selected locations and hubspots. Only official GMF entrance tickets will be accepted and guarantee access to the festival. 20. What not to carry to the Festival? Sharp objects like knifes, scissors, blades etc. Any form of weapons or explosives. 21. What are GMF ambassadors? As in previous years, GMF has a group of very dedicated GMF Ambassadors. They are GMF’s fans from the very first hour. This year, besides our regular sale, our ambassadors will also sell tickets. They are allowed to do so in return for an awesome GMF experience. So if you are being contacted by someone who is an ambassador, please know they are legit. If you have any doubts about who is contacting you, you are always free to contact us on info@gomadfestival.com with any questions you may have. 22. Can I cancel/change my already ordered ticket? No, it's not possible to cancel or change your GMF ticket. 23. Can I make group bookings for GMF? Groups bookings of 10 people can be made Online at the ticket portal. For groups larger than 10 please send an e-mail to info@gomadfestival.com for more information. 24. Will I receive my tickets immediately? When you buy your tickets online, BookmyShow (our ticketing partner) of GMF Team, will send you a purchase confirmation email including your e-tickets after your order is processed. 25. What is the refund policy? There is no refund once the tickets have been purchased. Your co-operation is solicited. 26. Can I pay in instalments? No, it is not possible to pay in instalments currently. But however at any point if this is possibility we will have this information updated. 27. Can I bring my camera/selfie stick? Bringing professional or semi-professional photographic equipment to this event is prohibited, unless agreed upon otherwise by means of an assigned press accreditation. Selfie sticks longer than 1 meter are prohibited as well. Normal digital cameras, Smartphone cameras and GoPro cameras are permitted. 28. Where can I stay during the goMAD Festival? Accommodation options are arranged at the Festival if you wish to stay in Royalty at the Palace Hotel or at the various Campsites attached to the venue. Those who wish to stay at any other hotels, dorms or homestays close to the venue; you are free to do so. 29. Where do I park? Parking zones will be made available at a walkable distance from the Venue. 30. Are there shuttle services? 31. What is included in a Ticket & Camping package? 32. Do I need to get my online tickets printed as a hardcopy? This is not necessary as we are trying to reduce paper and the impact on the environment. You can gain entry by showing the QR Code/Bar code and ticket confirmation on your smartphones. 33.	Who do I contact if I have any further queries?